Scattered thunderstorms during the morning becoming more widespread this afternoon. High around 70F. Winds SSW at 10 to 20 mph. Chance of rain 80%..
UNI s Drew Foster jumps into the arms of assistant coach Randy Pugh after winning the 184-pound NCAA championship Saturday night in Pittsburgh, Pa.
CEDAR FALLS -- University of Northern Iowa wrestling fans are invited to a celebration of Panther Drew Foster's NCAA championship. 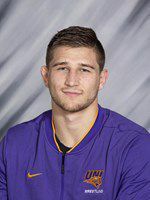 Foster, a senior from Mediapolis, defeated Max Dean of Cornell 6-4 for the 184-pound national title Saturday night in Pittsburgh, Pa., to become UNI's first national champ since Tony Davis won in 2000. Foster and UNI head coach Doug Schwab will be on hand Tuesday at Mulligan's in Cedar Falls. Foster will greet fans, pose for photos and sign autographs beginning at 6:30 p.m.
Foster closed out his Panther career as a two-time All-American. He finished seventh in 2017. UNI's NCAA Champion wrestler Drew Foster speaks with Syd Layton as he signs autographs and takes pictures with fans at Mulligan's in Cedar Falls on Tuesday evening. University of Northern Iowa national champion wrestler Drew Foster laughs with David Sims, 12, as Sims almost walks away with Foster's NCAA trophy as he meets with fans at Mulligan's in Cedar Falls on Tuesday evening. Foster won the 184-pound national title Saturday night to become UNI's first national champ since Tony Davis won in 2000. 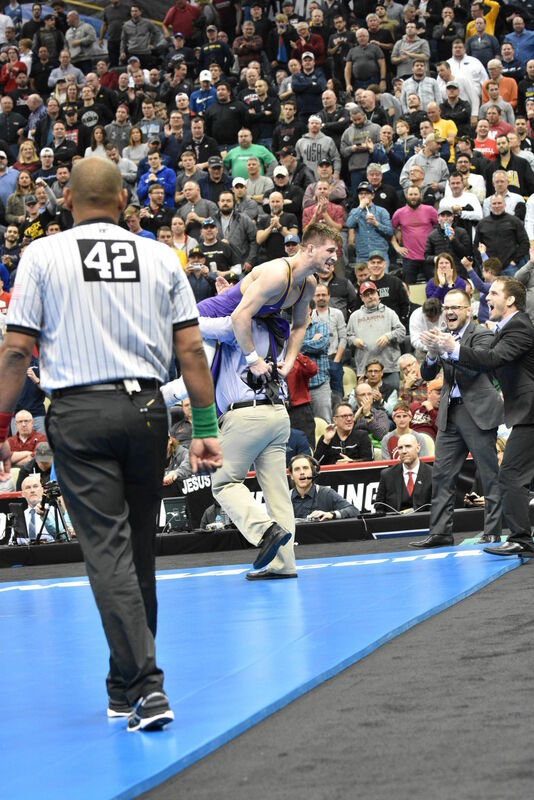 Northern Iowa's Drew Foster celebrates with Panther fans after winning the 184-pound national title Saturday at PPG Paints Arena in Pittsburgh, Pa.
Northern Iowa's Doug Schwab cheers on Drew Foster during his 184-pound national championship match Saturday at PPG Paints Arena. Northern Iowa's Drew Foster controls Cornell's Max Dean en route to winning the 184-pound national championship Saturday at PPG Paints Arena in Pittsburgh, Pa.
Northern Iowa's Drew Foster raises his hands in the air after winning the 184-pound national championship Saturday night in Pittsburgh, Pa.
Iowa's Spencer Lee lifts the leg of Oklahoma State's Nick Piccininni during the 125-pound semifinals Friday at the NCAA wrestling championships. UNI head coach Doug Schwab encourages Drew Foster from the sidelines during a 184-pound semifinal at the NCAA Championships Friday. Northern Iowa's Drew Foster and North Carolina's Chip Ness scramble during their 184-pound semifinal Friday at the NCAA wrestling championships in Pittsburgh. Northern Iowa's Drew Foster gets his hand raised after winning in the 184-pound semifinals Friday at the NCAA wrestling championships. Northern Iowa's Drew Foster scores on Virginia Tech's Zach Zavatsky en route to a 5-2 win in the 184-pound quarterfinals Friday at the NCAA wrestling championships in Pittsburgh, Pa.
Drew Foster celebrates his 184-pound quarterfinal win over Virginia Tech's Zach Zavatsky. Iowa's Spencer Lee lifts Minnesota's Sean Russell during the 125-pound quarterfinals Friday at the NCAA Championships in Pittsburgh, Pa.
Iowa's Kaleb Young scores the winning take down in sudden victory to beat Northwestern's Ryan Deakin in the 157-pound quarterfinals Friday. Northern Iowa's Drew Foster works to get out from under Binghamton's Lou Deprez en route to a 7-1 in the second round at 184 Thursday at the NCAA wrestling championships. Northern Iowa's Bryce Steiert fends off Michigan's Logan Massa in a second round match Thursday. Steiert upset the sixth seed, 2-1. Northern Iowa's Max Thomsen battles Navy's Jared Prince during a 149-pound first round match Thursday at the NCAA wrestling championships in Pittsburgh, Pa. Thomsen won the match, 9-8. Northern Iowa's Bryce Steiert tries to gain control of Indiana's Bryce Martin during their 165-pound match Thursday in the first round of the NCAA wrestling championships in Pittsburgh. Steiert won by fall. Iowa's Austin DeSanto scores against Penn State's Roman Bravo-Young en route to a 7-2 win in the second round Thursday at the NCAA wrestling championships. Iowa's Kaleb Young escapes the grasp of North Carolina State's Thomas Bullard en route to a 12-4 major decision in the second round Thursday at the NCAA wrestling championships.